Possibly Instagram’s most recognizable bike, this 1977 Yamaha XS750 was originally built by Brady Young of Seaweed and Gravel under the psuedo-name UGLY Motor Bikes in Southern California. The electronics and battery have been relocated and hidden under the custom metal seat cawl. The motor has been rebuilt with custom engraved filtered velocity stacks. A one off 3-3 baffled exhaust give this bike an aggressive sound that will put a smile on any enthusiasts face. The matte finish and use of leather gives this bike an overall look of a gentleman’s racer with the simplicity of the girl next door. The tank has been finished in a matte blue paint that has become its distinguishing feature. Leather accentuates the bars, kickstart and foot pegs… looks beautiful but I don’t foresee it lasting very long. Another Home Run by one of my favorite builders. Post Disclaimer: I’m not a billboard, nor do I get paid for reviewing these brands. I wear what I wear. I mention them only to anticipate the questions of where everything is from. I’ll let you know if that ever changes and I become like Roger Federer. I was gifted this suit by Suit Supply from a friend. The fit is as spot on as you may expect from an off the peg piece. And at a $500 retail price point, there’s just no better value. 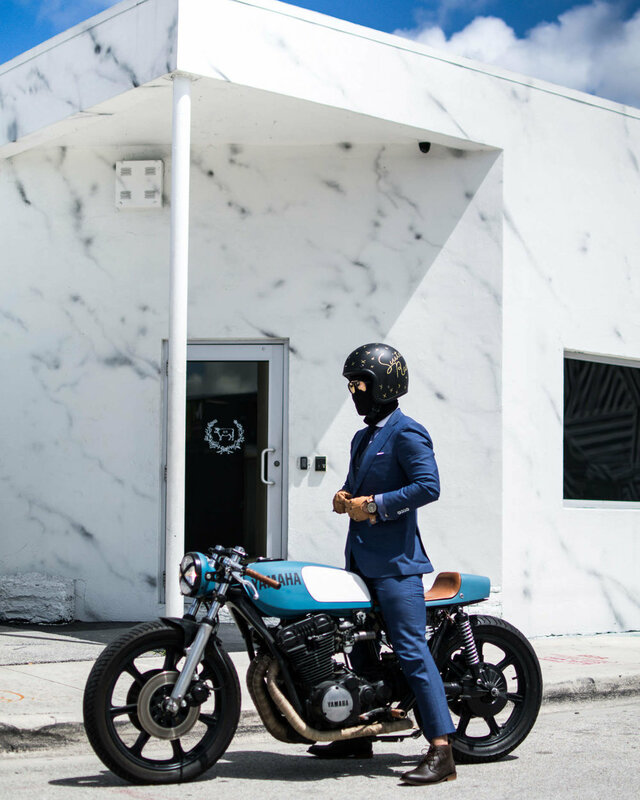 If you’re a bespoke suit consumer, this suit is not for you. All you other souls out there, it’s hard to point you in a better direction. The boots I’m wearing were made by a small independent bookmaker by the name of Moto Bailey. Their concept is to create functional riding boots that are stylish enough to use every day, out of KEVLAR. I encourage them to stay in business, and to add more silhouettes to their line. Genuinely loved them. Shirt: Sproos | Great fit for RTW, best value for those of you on a budget. Shoes: Moto Bailey | Durability on point, kevlar construction. Eyewear: DiRocco | Carbon fiber eyewear, need I say more? Helmet: Biltwell | The helmet comes black, I did the art myself. My mum is very proud.